Mustangs 3rd at Roy Griak Invite! 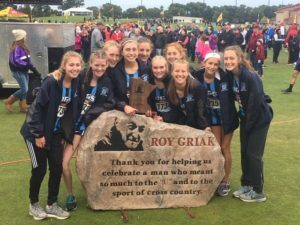 The DGS girls cross country team traveled to Minneapolis, Minnesota to compete in the prestigious Roy Griak Invitational meet this weekend. The Mustangs came home with the 3rd place trophy among a loaded field of 49 teams including several nationally ranked squads. Teams traveled from as far away as California and Georgia to compete against the best of the Midwest. It was a great display of the talent from the state of Illinois as Yorkville, Naperville North, and Downers Grove South finished in the top 3 places. Yorkville scored 104, Naperville North scored 113, and DGS scored 170 to all finish ahead of the nations #1 ranked team, Wayzata, MN (185 points). All three Illinois teams are ranked among the top 25 in the country and will likely improve on those rankings after this race. All three will face off again this coming Wednesday at the Naperville Twilight Invite where 8 of the top 10 teams in Illinois will battle it out. The 5K course at Les Bolstad Golf Course in Minnesota is a challenging, hilly course that does not give up very many fast times. And while conditions were excellent on Saturday, its tough to compare finishing times to any other course. As it should be with cross country, it’s all about places and DGS placed very well. Brenna Cohoon (Jr) led the Mustangs with her 14th place finish among the field of 455 runners that included several nationally ranked individuals. Brenna flirted with a top 10 finish as she moved between 9th and 15th throughout the race before crossing the line in 14th. Erin Reidy (Jr) continued her rise to the front of the pack with her 19th place finish. Erin started out well and slowly moved up throughout the race going from 26th at the 1 mile mark to 19th at the end. Melissa Weidner (Sr) has been a top DGS finisher all season long. On Saturday, as she was still recovering from an illness, Melissa ran a strong race to finish in 42nd place for the Mustangs. As soon as she returns to 100% health, our team will have a formidable top 3 group of runners. Over the past few years, the strength of the DGS team has been our tight pack and small 1-5 split. While that has continued to be the case so far this season, on Saturday, our pack got split up early on in the race. The girls were left to run as individuals, which is considerably more difficult. Yet, despite this unexpected circumstance, we still have several strong finishes to help the Mustang cause. Becky Versaskas (Sr) finished closely behind Weidner in 46th place. Becky was in 62nd place at the mile and steadily moved up as the race went on. Rebecca Diddia (So) also moved up well during race. She went from 79th at the 1-mile to 67th at the finish to complete the DGS scoring. Alex Spang (Fr – 76th place), Kennedy Warden (Jr – 82nd place), Kelsey Casella (Fr – 107th place), Olivia Duax (Sr – 111th place), and Sophia McNerney (Fr – 133rd place) rounded out the final five DGS positions. As our varsity team wraps up the regular season over the next couple of weeks, it looks to be a very exciting post-season ahead of us! Author Coach PlunkettPosted on September 30, 2018 September 30, 2018 Categories UncategorizedLeave a comment on Mustangs 3rd at Roy Griak Invite! Mustangs 1st at Naperville Invite! The DGS girls cross country team traveled to Naperville North HS for a rare Friday night meet on Sept.21. The Mustangs came home with 1st team titles on both the varsity and F/S levels in the 10-team invitational meet. In the F/S race, DGS scored 30 points to easily out-distance the host Naperville North team in 2nd place (52 pts). DGS placed 1-3-5-7-14, and Sophia McNerney (Fr) led the Mustangs with her individual championship, covering the 3-mile campus course in 19:11. Sophia took the lead about 800m into the race and never looked back, finishing about 20 seconds ahead 2nd place. Renee Kowalski (Fr) was the next Mustang into the chute. She placed 3rd overall in 19:54, while Ria Patel (So) and Sara Homberg (Fr) placed 5th and 7th respectively in 20:04 and 20:09. Gretchen Scheck (Fr) rounded out the Mustang scoring with her 14th place finish in 20:32. Sophomores, Maya Scheck and Olivia Meyer were the 6-7 runners for DGS with times of 20:40 and 21:10 as they finished in 18th and 30th place out of 178 total runners. This bodes well for the future of Mustang cross country as two other DGS freshmen and one sophomore competed in the varsity race. The DGS varsity team also dominated the competition, placing 1st as a team with 36 points. Naperville North, the top ranked team in Illinois, rested their top 6 runners but still finished in 2nd place with 68 points against a quality field that included #16 ranked Benet Academy. DGS placed its 8 runners in the among the top 16 finishers in the 78 runner race. Erin Reidy (Jr) led the Mustangs with her 2nd place finish, 25 seconds behind Iowa City Liberty freshman, Ashlyn Keeney. Reidy ran a PR 17;34 as she moved up through the field over the second half of the race to eventually reach the second position. Brenna Cohoon (Jr) did not have her best race, but still showed a lot of toughness with her 3rd place finish in 17:44. The Mustangs were without one of their top 3 runners, Melissa Weidner (Sr), who was out of town on a college visit. But the team is deep with talent this season and didn’t miss a beat as Becky Versaskas (Sr) finished in 8th place overall with a time of 18:17. The remaining five Mustangs in the race ran together as a tight pack for most of the race and all finished close together. Kennedy Warden (Jr) was 11th (18:20), Olivia Duax (Sr) was 12th (18:25), Rebecca Diddia (So) was 13th (18:29), Kelsey Casella (Fr) was 14th (18:30), and Alex Spang (Fr) was 16th (18:31). After taking last weekend off, this was a good tune-up for next week’s varsity meet in Minnesota. The JV team finished off the day with a solid team race, finishing 3rd behind Naperville North and Naperville Central. Allison Calek (Sr) led the Mustangs with her 5th place finish in a season best 19:48. Michelle Kurcina (Sr) placed 11th overall in the 186 runner race with a time of 20:20. Julie LaLonde (Sr) finished in 15th place with her time of 20:30. After the trio of DGS seniors, there was a significant gap back to the next Mustang, Sydney Gaspari (Jr) who finished in 43rd place in 21:59. Teagan Halik (Sr) moved up a lot over the second half of the race to finish as the 5th DGS scorer in 47th place in 22:06. Clare Quirin (Sr) and Grace Schultheis (Jr) were the 6-7 runners in 60th and 82nd places with times of 22:39 and 23:31 respectively. Full meet results can be found on the Athletic.net website and DGS individual splits/times can be found on the Schedule/Results page. The freshman Mustangs will travel to Leyden on Monday, Sept.24 to compete in a conference triangular. The varsity will travel to Minneapolis next weekend for the Roy Griak Invitational hosted by the University of Minnesota. The entire team will return to Naperville North on October 3rd for the Twilight Invite. Author Coach PlunkettPosted on September 23, 2018 Categories Cross CountryLeave a comment on Mustangs 1st at Naperville Invite! Mustangs 2nd at First to the Finish Invite! On Saturday, September 8, the DGS Girls Cross Country team traveled to Detweiller Park in Peoria to compete in the First to the Finish Invite. This was a huge meet with many of the best teams in Illinois in attendance, including 6 of the top 7 ranked Illinois teams. The Mustangs more than held their own against this top level competition by placing 2nd out of the 37 schools competing. Two time defending state champion, Naperville North (ranked #1 in Illinois and #3 nationally) took first place with 58 points. Downers South (ranked #3 in Illinois and #25 nationally) finished second with 92 points. Yorkville (ranked #2 in Illinois and #8 nationally) placed third with 93 points. Minooka placed a distant fourth with 182 points, followed by the remainder of the field. The Mustangs were led by returning All-State runner, Brenna Cohoon (Jr). She ran an aggressive race against a talented field and finished 5th out of 309 runners. Brenna’s time of 17:07 on the rain soaked 3-mile course bettered her own school record (set at last year’s State meet) by 1 second. Melissa Weidner (Sr) continued her inspired senior season by placing 16th in a PR time of 17:44. Erin Reidy (Jr) also stepped up her game and ran a PR with her 18th place finish in 17:50. Becky Versaskas (Sr) and Kennedy Warden (Jr) ran persistent, mentally tough races, and rounded out the Mustang scoring finishing in 26th and 27th places with times of 17:59 and 18:02. This meet allowed 10 varsity runners per team and DGS showed some great depth with their line-up. Rebecca Diddia (So) placed 42nd in 18:23. Kelsey Casella (Fr) placed 44th in a PR time of 18:24. Alex Spang (Fr) also PR’d with her 18:26 time and 48th place finish. Sophia McNerney (Fr) placed 56th with a PR time of 18:37. And Olivia Duax (Sr) rounded out the Mustang ten with her 66th place finish in 18:55. This was an incredible team performance and DGS was only team to have all 10 runners finish under 19:00. Downers South also placed 2nd among all of the teams in the JV race! Renee Kowalski (Fr) continued her fantastic freshman season by leading all of the Mustangs into the chute with her 14th place finish in a race of more than 700 runners. Her time of 19:51 was a PR. Michelle Kurcina (Sr) was close behind in 19:52 and 17th place. Allison Calek (Sr) ran a great race, often times leading our front pack, and finished 22nd in 19:59. She was followed closely into the chute by Sara Homberg (Fr) who finished with the same 19:59 time, placing 23rd. Sisters Maya Scheck (So) and Gretchen Scheck (Fr) were the next Mustangs to cross the finish line in 34th and 50th places (20:15 and 20:36) respectively. Ria Patel (So) placed 66th in 20:55 and Renee Nicholson (So) placed 67th in 20:56. When all was said and done, DGS had 40 girls race on the Detweiller Park course. Of that group, 21 ran lifetime PR times and all 19 of the other girls ran season best times! Full meet results can be found at raceresultsplus.com and all individual splits and times can be found on the Schedule/Results page. Video highlights from the varsity race can be found on the Pictures/Video page. The Mustangs compete next on Monday, Sept 10 at Willowbrook in a JV dual meet and again the following Monday Sept 17 at home vs Morton and Hinsdale South. All levels will compete on Friday, Sept 21 at the Naperville Invite. Author Coach PlunkettPosted on September 9, 2018 Categories Cross CountryLeave a comment on Mustangs 2nd at First to the Finish Invite! The DGS girls cross country team overcame multiple weather delays and a muddy, sloppy course to place 1st out of 17 teams at the Fenton Invite on Saturday. Because of the weather, all 3 levels were combined into one extremely large girls race with 431 runners. The Mustangs showed why they are regarded as one of the best teams in the state with a victory over several other top 25 ranked teams. DGS finished with 7 runners in the first 11 places and scored 26 points to easily out-distance the 2nd place team from Prospect with 115 points. Brenna Cohoon (Jr) placed 2nd overall in 18:15 over the 3-mile course. Melissa Weidner (Sr) and Erin Reidy (Jr) placed 4th and 5th respectively with times of 18:45 and 18:55. Alex Spang (Fr) and Becky Versaskas (Sr) completed the DGS scoring with their 7th and 8th place finishes in 18:59 and 19:00. Rounding out the varsity top 7 were Kennedy Warden (Jr) and Kelsey Casella (Fr) finishing in 10th and 11th places with matching times of 19:07. One of the unfortunate consequences of combining all the levels into one race is that there were no standings or awards for a F/S or JV race. It’s obvious that DGS would have done very well on both levels both individually and as a team. Rebecca Diddia (So) and Sophia McNerney (Fr) finished 16th and 17th overall. Olvia Duax (Sr) was 52nd, Renee Kowalski (Fr) was 65th, Sara Homberg (Fr) was 70th, Allison Calek (Sr) was 79th, Michelle Kurcina (Sr) was 83rd, and Julie LaLonde (Sr) was 86th. After taking out all of the varsity runners in the race, these individuals would have all finished in the top 10 of their respective F/S or JV races. DGS competes next Saturday, Sept.8th at the First to the Finish Invite in Peoria. Author Coach PlunkettPosted on September 2, 2018 Categories Cross CountryLeave a comment on Mustangs win Fenton Invitational!